their quality will constantly provide lessons to (our) artisans. archaic vessel (such as this) is more aptly carved with archaistic dragons. Whilst shapes may appear the same, the results are slightly different; which is why some are suited to ritual wares used at the Imperial ancestral temples. As such these worthy laws were followed by the Zhou concubines. * These are references to the Book of Odes of the Southern Zhou period, the first comes from the first chapter on marriage and happy union, and the second is from the eleventh chapter referring to the birth of many sons. 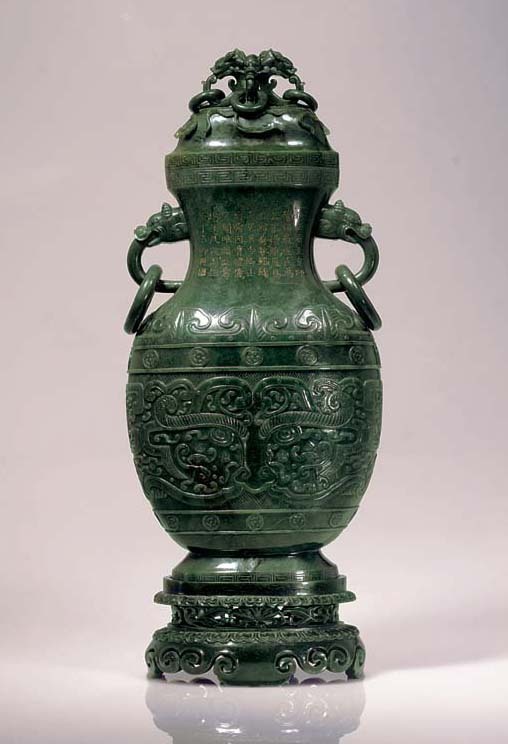 Both the poem on the neck and the mark on the base refer to the archaistic inspiration for the present vase, a bronze hu from the Spring and Autumn Period. This massive vase, together with lot 1387, its companion vase also previously in the collection of Prince Ching Wang, belongs to the Qianlong fanggu series, 'made in imitation of antiquity in the Qianlong reign'. Archaistic jades were especially prized by the Qianlong emperor, who was greatly influenced by the classic work, the Liji, (Book of Rites). As early as the eighth year of his reign (1743), he ordered that copies of the two volumes of the Kaogu tu (Illustrated Catalogue of Antiquities) should be given to those responsible for imperial jade carving to enable them to follow the ancient designs. Archaism was also much favoured by the emperor during the second half of his reign when he rejected other 'vulgar' styles, and the imitation of ancient style was specifically recommended by him in imperial poems, such as those inscribed on an archaistic ding and zun in the Palace collection, dated 1783 and 1773 respectively. The dating of the present vase is of interest, as it is close in date with the Beijing ding and zun. The taotie motif on the lower body is very similar to that on an 18th-century spinach jade hu in the Asian Art Museum of San Francisco, illustrated by Lefebvre d'Argencé, Chinese Jades in the Avery Brundage Collection, Japan, 1977, pl. LII.